Devoted to expert craftsmanship and exquisite design SAGAN Vienna is offering handbags, small leather goods and home accessories. Launched in Vienna in 2012 by Tanja Bradaric (Croatian) and Taro Ohmae (Japanese). Formerly known as Bradaric Ohmae, the brand was renamed in 2016 to SAGAN Vienna. The philosophy of SAGAN Vienna is to create functional, quality pieces with a sense of uniqueness and relaxed elegance. It is an encounter with familiar, charged with history, the well known that spurs new ideas. SAGAN Vienna is familiar done differently. All SAGAN Vienna goods are created with finest materials and manufactured by skilled artisans in Vienna and Europe. In Japanese the word “sagan” means “the left bank” or “the left side of a river” and the expression implies a sensibility for idiosyncrasy and inventive non-conformity that strongly resonates with brand design philosophy. One of the items that make a traditional Viennese café quintessentially Viennese are its elegant chairs. The first bentwood chair, the famous 214, was designed in 1859. Then in the late 19th century during the era of Gustav Klimt and Egon Schiele, the collection was consistently growing. These bentwood chairs were quickly embraced by cafés in the whole world. They have a woven mesh seat made from natural cane. These exquisite octagon shaped waves are called the "Wiener Geflecht" (Viennese wickerwork). Thanks to improved productivity during the industrial revolution, Thonet sold more than 50 million chairs worldwide. Hardy yet comfortable, these Thonet chairs are considered a modern day industrial product design classic. Now, in present day Vienna, in the namesake city of the "Wiener Geflecht", a handbag brand was launched by a design duo in 2012: "SAGAN Vienna" are Tanja Bradaric from Croatia and Japanese born Taro Ohmae. Even in this day and age, there still are great differences between Croatia and Japan. Culturally, historically and ethnically, the two countries share very little in common. Yet, as chances have it, two people with such diverse background ended up in the city of Vienna, studied at the same university, and decided to establish a design label together. The "Wiener Geflecht" is an integrate part of SAGAN´s Vienna handbag design. Almost like a symbolism to their brand, SAGAN Vienna often incorporates it to their classical designed handbags made from finest Italian leather. The delicate patterns of the hand woven cane coupled with a serene form of the bag make for an elegant and sophisticated design. SAGAN Vienna have a habit of surprising us with familiar but unique selections and pairing of materials; in the past collections they´ve used such wide-ranging materials as felt for Austrian folk costumes and Transylvanian vintage linen from neighboring Romania. 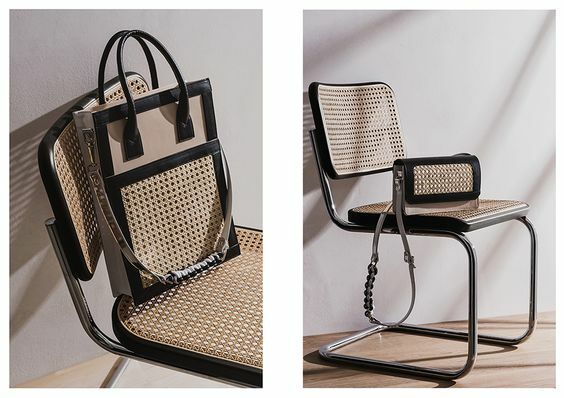 By adding hand knotted leather ropes as a signature element to a shoulder strap, they successfully managed to find an unexpected balance between delightful and smart. There is a quiet but strong sense of purpose that dominates the creations of SAGAN Vienna. With mediterranean laid-back spirit as a source of inspiration, Tanja Bradaric´s design turns today´s hectic world into something beautiful. So, go ahead and take a SAGAN Vienna bag to your next adventure. It will give a simplest of everyday style an air of sophistication; because SAGAN´s Vienna striking designs is the epitome of polished modern sense of style. Let me tell you a story of another chair. Taro Ohmae had a chair in his childhood home in Osaka, Japan. It was the chair "S 32" designed by Marcel Breuer in 1929/30 at Bauhaus in Germany, produced by Thonet. Bauhaus, as you know, was a revolutionary art school that applied functionality, pragmatism and productivity to its creations, which was quite a departure from the aesthetic of classic European design. Breuer used steel pipes as a frame for the "S 32" chair, one of the first such designs in the world, and wooden frames painted in black for a seat and back. Inside of the frame is a cane woven in octagon shape, again the "Wiener Geflecht". With the help from the epoch-making designer´s vision, the versatile product that is the "Wiener Geflecht" transformed itself from a "vintage" classic to a design that can withstand a test of time. Ohmae still remembers the chair fondly. How the seat made of an organic material looked welcoming, how it creaked when he sat on it. It was a design that was durable and dignified in its beauty. In the world of fashion design, everything is interconnected. Ohmae´s story about the "Wiener Geflecht", how he re-discovered it when he saw Thonet chairs in Vienna, and how he re-defined it with Tanja by making it a part of their design, is a testament to that fact. SAGAN Vienna bags embody a microcosm of serendipities and inevitabilities that is the world we live in. A chance encounter of two opposites spurs new ideas. From there a spark, a new style is born and that in turn will inspire someone somewhere to create a next generation of style. It is perhaps a longing to a future still to come, or it may be a pursuit of beauty in utility and practicality that motivate a new creation. And it´s always a thrill and excitement that burn in our heart that push us forward in the never stopping flow of time.